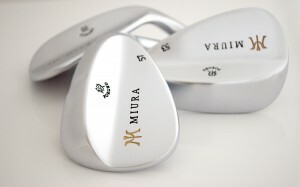 Marked with a Japanese character, a kanji that translated means “striving” or “noble effort,” the New Wedge Series from Miura Golf are so well crafted they almost could be considered works of art in addition to being wonderfully designed golf clubs. The New Wedge Series are available in odd-numbered lofts from 51 degrees to 59 degrees and each has a precise leading edge and bounce angle designed for consistency and control. After all, wedges are not for hitting the ball a long distance but for knocking it close to make birdies and pars. The amount of offset changes with the wedges loft, highest in the 51 degree model gradually decreasing until there is actually onset in the 57- and 59-degree models. The New Wedges have very tight tolerances with weight variation within 1/56th of an ounce. Head weight range from 297 grams in the 51-degree model to 307 grams in the 59 and are made to tight tolerances of with 1/56th ounce. Miura’s New Wedge Series are available at select custom fitting shops and carry a SRP of $235.